Voters from Jay, Livermore and Livermore Falls approved all warrant articles for $19.6 million budget for 2019-2020. JAY — Voters in Regional School Unit 73 approved all 17 articles Thursday night for the $19.6 million budget for 2019-20. The budget, up 4% from what was approved last year, will next go to a vote in each town April 23. If approved, the amounts to be raised in taxes by each town for the budget are: Jay, $6.14 million, increase of $486,618.77; Livermore, $2.09 million, a $182,776.37 increase; and Livermore Falls, $1.95 million, an increase of $227,794.69. 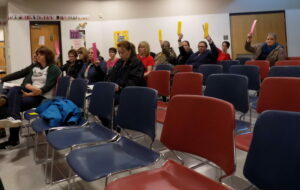 The article drawing the most discussion was for a $195,000 contingency fund, which voters approved. Jay Selectperson Judy Diaz asked why the fund was added. Interim Superintendent Bob Webster said budgets for 2017-18 and 2018-19 were frozen to pay for unexpected expenses. Items not budgeted for 2018-19 included more kindergarten students and additional expenses associated with the Siemens construction projects. Webster said local tax assessments in 2015-16 were $12.4 million. That has decreased each year since, to $9.4 million last year. The board approved $50,000 for a school resource officer for Spruce Mountain Middle and High schools, contingent on Jay appropriating an additional $50,000. Also approved: An increase of $195,000 for the local share for adult education, with Jay, Livermore and Livermore Falls each paying $65,000. Robyn Raymond, director of adult education, said an additional teacher was needed because the program has grown more than 173 percent. NOTE: The article has been changed to put in the correct proposed town assessments, if the budget is approved. It was a reporter error.